Summer squash patties are nothing new, but I wanted to try making this classic vegan dish with aquafaba as the egg replacer. Success! If you’re new to aquafaba, it’s the liquid left over after you drain canned or cooked beans. It’s not the bean soaking liquid – it’s the cooking liquid. You can read all about aquafaba here. The thing about cooking with aquafaba is that then you’re left with around two cups of beans. A person can only eat so much hummus, so I’ve been working on other ways to use these suckers up. You can use yours to make sriracha roasted chickpeas or this easy garbanzo bean soup. I’ve got another roasted chickpeas recipe coming tomorrow, too, if you want to try something new! 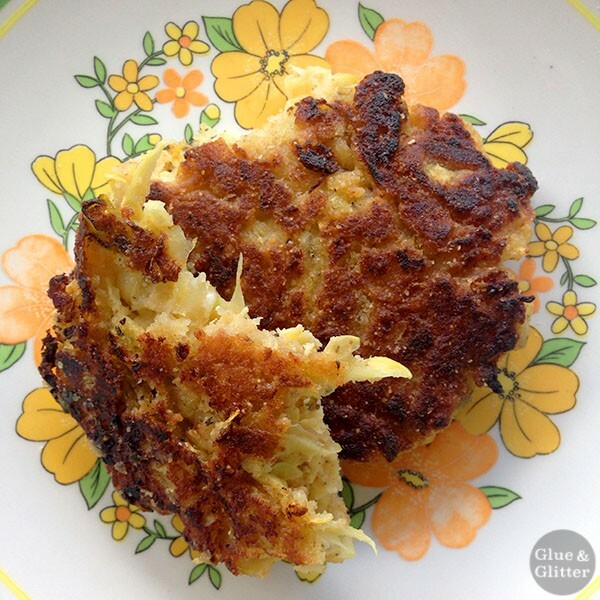 I first had squash patties – aka vegan crab cakes – long before I went vegan. I was just out of college, broke, and pescatarian at the time. My roommate and I were both from south Florida, and we missed crab cakes but couldn’t really afford to make real ones. 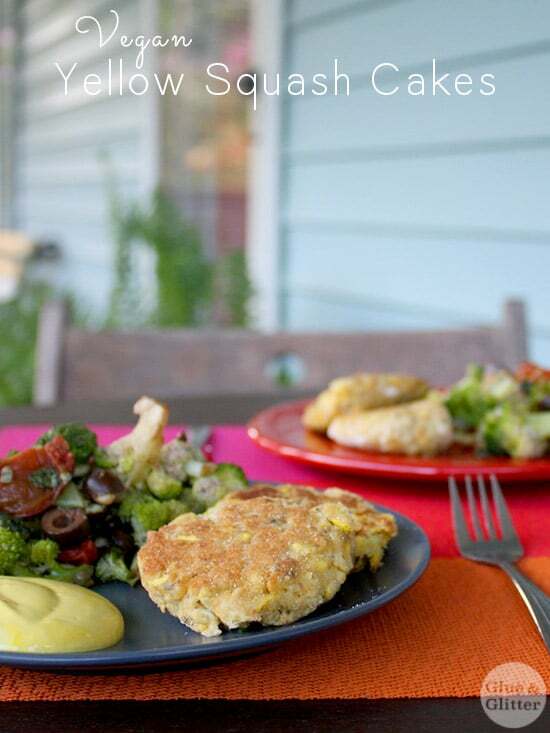 She ran across a recipe for squash patties, and we put it on our menu to eat ASAP. We both doubted that shredded zucchini would satisfy our crab cakes craving, but it totally did! We made these a lot after that first time, and when I went vegan years later, I veganized it. I’ve long since lost the original recipe, so if you know where it comes from, please drop a comment! These vegan crab cakes have evolved a bit from that original veganized recipe.they use aquafaba as the egg replacer, yellow squash instead of zucchini, and I’ve adjusted the seasonings quite a bit. You could substitute zucchini for some or all of the yellow squash, if you like. 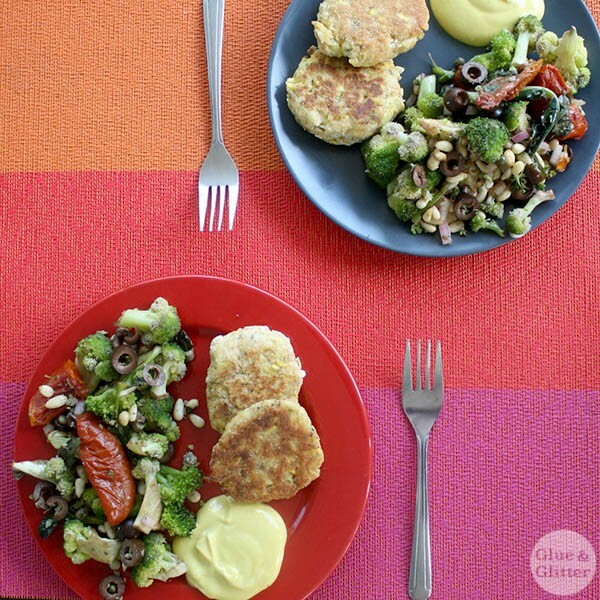 Serve your squash patties over greens with a little salad dressing drizzled on. Stuff them into a sandwich. Or eat them as an appetizer with a vegan mustard and mayo dipping sauce (recipe below). Whatever serving suggestion you choose, you won’t be sorry! 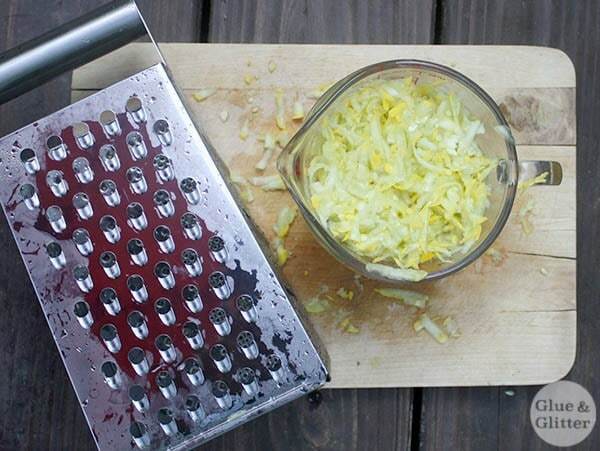 2 packed cups grated yellow squash (about 2 medium yellow squash or 3 zucchini should do the trick) – I used a cheese grater, and it worked great. Combine all of the ingredients, except for the flour and olive oil, in a large bowl. Stir well to combine; the dough will probably seem runnier than it ought to, but it should be pretty messy at this point. Transfer the dough to the refrigerator to chill for at least 30-45 minutes. Shape the mixture into 8 small patties and dredge in the flour. Fry those puppies on medium high heat until they’re crispy on both sides, just 2-3 minutes per side. See the cooking notes below! In a small bowl, whisk your ingredients together. This batter is very, very soft, but it firms up nicely in the pan. Just be gentle while you make the patties and coat them in flour, and you’ll be good. There is a pan-sticking factor with these, so use your spatula to move them around gently as they cook. Add more oil between patties, if needed. My yellow squash patties cooked up nicely when I let them go for 3 minutes on the first side and 2 on the other. Every squash is different, and cooking time will vary depending on your squash’s moisture content. Just keep an eye on things. You can always flip back to the first side for an additional minute, if you need to. We made these and they were great! We tried them originally on their own, then the leftover patties on hamburger buns with fixings. Thanks so much for the recipe! dang, these look so yummy! Thank you! They are so good. I was amazed at how they firmed up in the pan. The batter consistency had me worried.